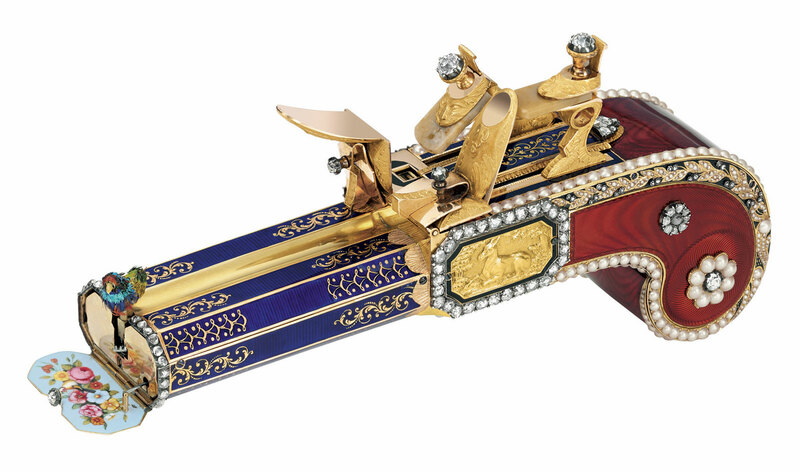 The only publicly known matching pair of mirror-image gold, enamel, agate, pearl and diamond-set Singing Bird Pistols, made for the Chinese Market, sold for $5.8 million at a Christie’s International Important Watches Sale in Hong Kong. 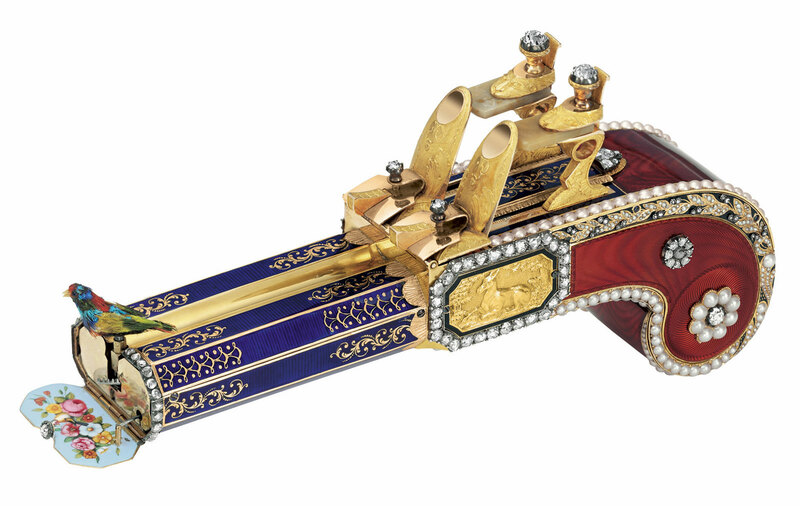 The pistols, attributed to world-renowned craftsmen Frères Rochat, which don’t tell time but they have the mechanical action similar to a windup cuckoo bird, were the most expensive lot of the sale. 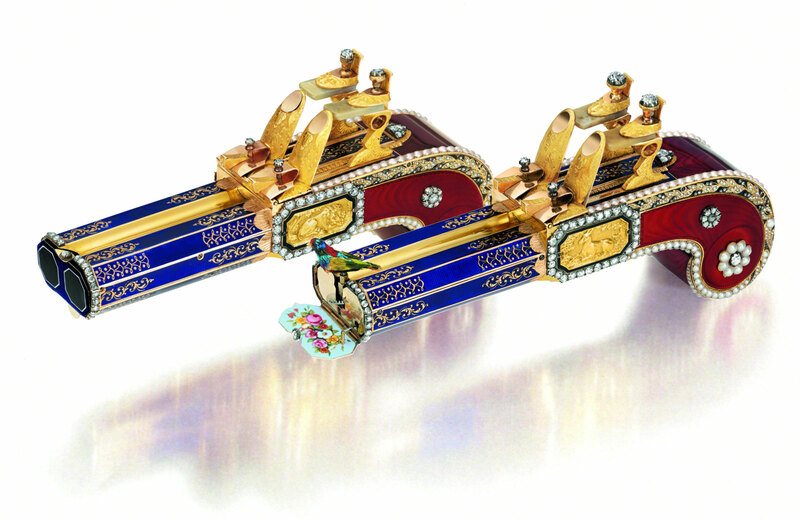 A stunning marriage of 19th century Swiss automata technology and exquisite craftsmanship, this pair of singing bird pistols epitomizes the creativity of watch makers in Europe to satisfy the ever-growing demands for clocks and automata by the Imperial court and its courtiers in China, as well as European aristocrats and royal families, particularly in the 18th and 19th centuries. Barely a handful of single singing bird pistols are known in the entire world and they are found in the world’s most prestigious museums and private collections. One single pistol is found in the Museum for Islamic Art in Jerusalem which houses the Sir David Salomons Magnificent Collection of Clocks and Watches. Another single pistol is recorded in the Maurice Sandoz Collection in Switzerland. The Patek Philippe Museum in Geneva, Switzerland owns two single pistols, one of which was purchased at Christie’s in 1989. The only publicly known matching pair in the world were included in a 456-lot sale of timepieces that raised $21.2 million, the highest tally for an Asian watch sale, the London-based auction house said. The most expensive conventional watch sold at the sale was a Patek Philippe moon phase wristwatch, made of pink gold and featuring a manually wound calendar chronograph. It sold for $1.21 million to an Asian collector, Christie’s said. Also of note was a extremly rare platinum manually-wound double dialed wristwatch with twelve complications, which fetched $1,16 million.